Looking for better sound quality or a more stylish look from your earphones? Compare some of the biggest brands in the market with our customer satisfaction ratings. Canstar Blue research finalised in September 2015, published in October 2015. We’re able to report that customers of Bose have made themselves heard the loudest, rating the brand more highly than anyone else. If you have an active, busy lifestyle, you’ll need products in your life that are able to keep up with you. And if you also happen to be a big fan of music, you’ll need a pair of earphones that provide the quality and comfort to keep you moving at a fast pace. And of course, you’ll want them to look good too. Whether you’re a regular walker or runner, earphones are the perfect companion to keep you company, and motivated, while you’re out and about. However, not all earphones are created equal and there can be a big difference between those that enhance your outdoor experience, and those that hinder it. Earphones can be your best friend, but also your worst enemy. So to find out which brand has struck the perfect balance between sound quality, comfort, style and value for money, we asked almost 600 consumers who have purchased a set in the last two years to rate them across a range of categories. Having “road tested” their earphones, they are well-placed to offer you some guidance for the next time you need to buy a new set. 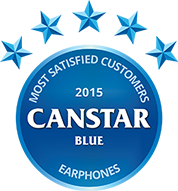 And in this inaugural year of our customer satisfaction ratings for earphones, we’re able to report that Bose was rated 5 stars in Overall Customer Satisfaction by Canstar Blue for Earphones in 2015. In this review of earphones, we’re specifically referring to in-ear earphones – which include earbuds and in-ear canal earphones. Basically, any type of headphones that are placed inside your ear. Click here for our review of larger headphones. Earbuds – these earphones sit loosely inside your outer ear. They tend not to produce amazing sound, but they are easy to carry around and can be very cheap to buy. In-ear-canal headphones – these use eartips that fit snugly, and fairly deep, inside your ear canals. They block external noise well, but can feel uncomfortable. Canalbuds – these earphones represent the middle ground between standard earbuds and in-ear-canal headphones. They are also inserted into your ear canal, but use smaller eartips and are not inserted as far. You may not get the same quality, but what you lose in sound, you might make up for in comfort. Small earphones tend to be relatively inexpensive, but this does mean you might be forced to replace them more often than you’d like. Our survey respondents spent an average of just $49 on their earphones and 41% admitted that they tend to buy the cheapest set available and then simply replace them when they stop working. That will have an impact on the average lifespan of earphones – which was 2.8 years, we found. These findings reflect those from our larger headphone ratings, with value for money the biggest driver of customer satisfaction. Bose is an American corporation that specialises in all manner of audio equipment, including home speaker systems, professional sound systems, automobile sound systems and various types of headphones. The company’s goal, it says, is to create products and sound experiences that its customer simply couldn’t get anywhere else. Founded in 1964, Bose also has a strong focus on innovation and creativity. Philips is a Dutch technology company that makes all manner of electrical products, including TVs, DVD players, radios and other appliances. It also produces a large range of earphones and headphones – branded as Fidelio, CitiScape, ActionFit and DJ Headphones. Philips has a strong focus on comfort and style. “Carefully chosen design materials and detailing allow you to convey a sense of style while listening to your favourite tunes in cool comfort,” it says. Sennheiser is a German audio company that specialises in the design and production of a wide range of consumer and high-fidelity products, including microphones, headphones, telephony accessories and avionics headsets. It has a large range of over-ear, on-ear or in-ear headphones and says “no matter what you expect from your headphones or headset, there is a Sennheiser for you – offering high-quality design and the legendary Sennheiser sound”. Apple is an American multinational technology company that designs, develops and sells a large range of electronic devices, computer software and online consumer services. It’s probably best known for the iPhone smartphone and iPad tablet computer, but the company also produces many smaller electronic products as accessories to its larger ones. Apple sells standard in-ear and noise-isolating earphones. Sony is a Japanese multinational conglomerate corporation, perhaps best known for its gaming and entertainment devices. The company produces all types of electrical equipment, from TVs to games consoles, and boasts an extensive range of different headphones, including overband headphones, wireless headphones, in-ear headphones and related accessories such as portable headphone amplifiers. Sony promises high-resolution audio from its headphones, which it says are “the definition of sound and style”. Canstar Blue commissions Colmar Brunton to regularly survey 3,000 Australian consumers across a range of categories to measure and track customer satisfaction. The outcomes reported are the results from customers within the survey group who have purchased new earphones in the last two years– in this case, 584 people.